Well, that’s because my grandparents ate ACTUAL wheat. Not the GMO Franken-wheat that Monsanto has decided we should all love, embrace, enjoy, and then crap ourselves silly. Honest truth. Celiacs can go to the Middle east where they still have Einkorn wheat plants from centuries ago, eat a big tub of it, and blissfully go about life. Come to America and breathe the flour from a cupcake store and develop inflamed joints, bronchitis, and shiver on the bathroom floor within hours. It seems like it’s been a very long time since I first got the shocking news that wheat was about to put me in the hospital. And in the past 7 weeks, there have been some interesting food adventures but overall, it’s like a whole new life. So what have I learned? 1. I know without a shadow of a doubt if I’ve been “glutened” or contaminated. The first signs are a noisy and severely bloated stomach. People think my stomach is growling and I’m hungry..no it’s just gearing up for some digestion misery that will unleash the next morning. In the meantime, I get a sudden feeling of fatigue and brain fog that is so very noticeable now. Then I will have very sore joints in my elbows. Very weird. But the obvious sign is the next morning. Without going into detail there is a stark difference between a gluten contamination elimination and a normal one. 2) Even the tiniest amount of gluten can cause a reaction and the reaction depends on the amount. The day I ate a chicken sandwich with a bun was by far, the worst reaction I’ve ever had. It was 8 hours of trips to the bathroom. Thank goodness it was during the summer so I wasn’t at work. I couldn’t have been at work. The brain fog confusion and dizziness alone would have kept me from driving my car. But here it is a few weeks later and just a hint of wheat causes all the symptoms, but instead of 8 hours of fun, I might be fine after the first initial digestion explosion. I can deal with bloated tummy and fatigue. Really, it’s not life-altering. But the other…I kinda need to be confident that I’m not going to need a change of clothes if there is a line at a bathroom. Needless to say, I’ll gladly give up pizza and cupcakes for the rest of my life. And that leads me to #3. 3) This isn’t going to just go away. 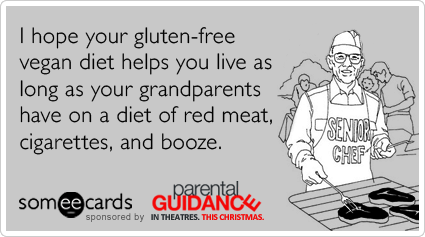 Deep down, I thought (hoped) that once my stomach and intestines heal themselves that I might be able to occasionally “ease” back to eating gluten (btw….gluten is in wheat, barley and rye. 99% of my contamination is through wheat. It’s in EVERYTHING). From my own experience over the past few weeks, and what I’ve been reading, this doesn’t go away. There is no cure, so to speak, other than just NOT eating gluten products. And at first, I didn’t care about ever eating wheat again because my life was so much better. I actually had a life that wasn’t revolved around where the bathrooms are located. But now that I’m a little more removed from those miserable weeks of May-July (when things started getting a lot worse. The first signs go back a couple of years), I’m noticing some cravings for “normal” eating like game day cupcakes, stopping for a pizza, a sandwich from my favorite Greek restaurant. But if I really sit and analyze, it’s not the food, I think I’m craving the comfort factor and good memories tied to some of these foods. That, and just the plain ease of eating like everyone around me. 4) I have to speak up or starve. Eating GF at home is not a problem at all. In fact, Stephen eats the same things I eat. The only differences so far are pancakes and using non GF cornmeal mix to coat his fried fish and cornbread. That’s it. He loves spelt pancakes. So I’ll make my GF pancake mix and pour some in another bowl and add his spelt flour (while wearing gloves and making sure my bowl is tightly covered. That stuff is airborne). So home cooking is the clear way to go. Eating out is almost impossible to prevent a contamination. Yes, there are tons of food options that do not actually contain wheat/gluten. But it’s the cooking area that is the problem. If we go to a restaurant that does a lot of bread making, coating/frying, or pasta cooking, then gluten is in the air. It’s going to get on my food. What is new on the No-No list? 1) Dale’s maridade. We use this marinade on our steaks. After a suspicious reaction, I looked at the label. It contains soy sauce and soy sauce is made with wheat. It was the first ingredient. Oops! 2) Communion bread for Church. We use tiny squares. Surely that wouldn’t affect me? Wrong. 3) Pre-packaged “seasonings”. Those wonderful packets that I use for 2 dishes: beef stew and meatloaf. They have thickeners in them…..wheat. This week, I made my own gravy using potato starch and a Penzey’s spice called “beef roast”. Spices are gluten free. Seasonings can be anything and even on the label, if it reads “seasonings”, beware. Flour is a seasoning. It is NOT a spice. What is the most surprising result? Reproductive health. No, I’m not pregnant, but this past month was a complete 180 from previous months since going off the BC pill. While on BC, my cycles were very pleasant and did not affect my life at all. After going off them, I was back to doping on medicine for more days and riding the mood swings that I tried to control. After just 3 weeks of GF, I barely noticed my very regular cycle. I kept waiting for it to get worse but not 1 dose of naproxen used. I could get used to that. What’s next? More exploring what does and does not have gluten, continuing to keep expanding my diet to more whole foods/raw foods and working on that balance between treats occasionally instead of treats everyday because they are “gluten free”. They are not “salt, sugar, overprocessed crap-free”. I’ve had more potato chips in the past 7 weeks because they do not contain flour. Why? I don’t love potato chips. I never have! So why now? Because my favorite crackers are exiled? Makes no sense. So I’m working on the mental games with food. And that is a whole new post and whole new trip to a therapists’ couch. 🙂 Happy Saturday! I am right there with you living in GF land. Well, most of the time. Ugh. You are right about the mental food games we play with ourselves. I also have issues with dairy and eggs, but a daily probiotic seems to help with that. The dairy and eggs are no brainers, I don’t eat either of those things unless I have been taking a probiotic or unless I am at home….for the day. Gluten, on the other hand, isn’t so immediate for me, so I find myself enjoying now and paying later. My symptoms arrive the next morning when I am “hungover”. My intestines burn and cramp, I feel dehydrated, foggy and lethargic. Ugh. I feel so much better when I just leave all foods that bother me alone, but sometimes I just want to dig into the bread basket at a restaurant or eat a big fat sandwich! ha! It’s just food right? Seems silly that is can be so tough at times!